Have you checked out my Facebook Fan page? If not, I would! 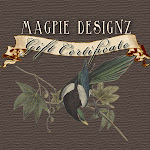 You can find the latest designs, sales, giveaways, freebies, and so much more! So visit my FAN PAGE and make sure to suggest the page to your friends! By the way, have you seen my new Daddy's Dog Tag necklace? Perfect for the proud daddy!